The Formula1 round seven of the FIA Formula1 World Championship folded with Mclaren celebrating their second one two of the season but without Red Bull collision it would 3rd and 4th place for the british team,but the good thing is that Mclaren were very close to Red Bull and were able to challenge them,and the question is What happened to Ferrari ? Mclaren were very happy they were able to challenge for pole yesterday and their race pace was as good as Red Bull or better than them as we never managed to see one of their cars in clean air ,after the Red Bulls collided the team told the drivers to save fuel and then Button closed on Hamilton and was able to pass him round turn 12 but Hamilton repass at the main straight after they banged wheels at turn one, maybe the team told them to save fuel not to race each other. The Red Bulls were very fast as usual and they should have ended with a one two finish it was very close between Webber and Vettel, they should learn to control their drivers the good thing is they were allowed to race each other but they should learn to give room for each other like we saw with the Mclarens, but they still remain the team to beat in the next races. Mercedes had a good race with no troubles but they had higher hopes for the race than 4th and 5th but still a good race for them and Micheal Shumacher who was able to finish ahead of his teammate. Both Renault drove a great race with Kubica challenging the Mercedes and able to keep Massa behind and scored a valuable points ,Petrov was able to keep Alonso for almost the whole race but when the Spaniard passed him he had a puncture that put out of the points but still he set the fastest lap of the race. The biggest question of the weekend is what happened to Ferrari what happened to their speed Massa was stuck behind Kubica for the Whole race and Alonso passed Petrov in the final laps they need to analyze their data to see what happened and they need to act fast their next upgrade will come in Valencia. Sutil drove another good race despite losing time with a problem with the right front wheel during his pit stop. He made a nice, aggressive pass on Kobayashi late in the race, which was subsequently rewarded when 10th place became ninth as Petrov pitted with a puncture on lap 54. Liuzzi had better race pace but once again found his VJM03 gripless in comparison with his team mate's. As one insider remarked, BMW Sauber never envisaged being happy about a 10th place finish at the start of the year. But their hard-fought first point was gratefully accepted after Kobayashi and De la Rosa gave their crew nervous moments in the closing stages. In view of what had happened with the Red Bull and, to a lesser extent, the McLaren team mates, it was nail-biting watching the Japanese and the Spaniard finish only two-tenths of a second apart. Kobayashi had earlier run ahead of Sutil, but had to back off in Turn 8 when he started to see canvass appearing through his right front tyre. Buemi's race was ruined when he lost momentum trying to pass a slow-starting De la Rosa round the outside of Turn 3. That forced him wide and let Hulkenberg by, and as the Swiss tried to repass the German in Turn 7, the Williams understeered into the Toro Rosso, puncturing the right rear tyre. Both Williams finished the race, which was a relief after the troubles in Monaco, but 14th and 17th places were nothing to cheer. Barrichello had a clutch problem that ruined his start, then encountered a problem with a front wheel when he decided to stop earlier than planned as his pace was better than the cars immediately ahead. Hulkenberg's race was compromised from the start when he and Buemi got together in Turn 7, puncturing the front left tyre. Virgin won the new team's race, but not without a big fight. Di Grassi started from the pit lane after oil systems problems were solved which had necessitated removal of the Cosworth engine. Glock lost a place to Senna at the start, fought back, and was able to pull away and moved ahead in the newbie stakes when the two Lotuses retired. Five laps from the end his hydraulics also malfunctioned, but he was able to make it to the flag with just fifth gear operative. Di Grassi went on to have a spirited fight with Senna as both VR01s finished. Senna enjoyed a really good fight with Di Grassi's Virgin, which showcased the HRT F110's similar speed, so was disappointed when his fuel system malfunctioned and forced him out. Chandhok elected to start on the harder Bridgestones and struggled until the options went on at his first pit stop. Subsequently he picked up pace, but also ran into problems with his fuel pump and was not running at the finish. As usual the Lotuses looked stronger in the race than in qualifying as they lapped less than two seconds slower than their benchmark, the Cosworth-engined Williams, but this time they were let down at similar points in the race with hydraulic problems, Kovalainen in the pits, Trulli out on the track. Mclaren take one two victory in the FIA Formula1 Round Seven in Turkey As the early leading Red Bulls crashed, with Micheal Shumacher in solid fourth place. The race strated with hot temperature as the drivers starting on the clean side of the track made a great start as Vettel was able to pass Hamilton and Micheal Shumacher Also passed Button into fourth place,But Hamilton passed Vettel right at turn three And button passed Shumacher at the end of the back straight. Fernando Alonso was the first to make a pit stop and was able to pass Both Adrian Sutil and Kamui Kobayashi ,Sebastian Vettel stoped first of the leading four two laps later Hamilton And pole sitter Webber stoped and the order between those to stayed the same but Vettel managed to pass Hamilton for second Button stayed longer on the track but couldn't pass any of them to came out in 4th place. As the race went on the started to fall but not enough to make the cars change their tyres ,but Sebastian Vettel closed the gap to Webber and was very close at the back straight and was wheel to wheel with Webber but suddenly both touched wheels and Vettel started to spin and got puncture in his right rear wheel and Webber broke his front wing that but the Mclarens one two with Webber now third. moves always end up with a broken something as in Brazil 2009 with Kimi Raikkonen and in Germany 2009 with Lewis Hamilton and Rubens Barrichello . With ten laps to go and with Hamiton short on fuel Button started to catch him and at the back straight he made a move just like Vettel but the british drivers were very careful and Button was through but Hamilton fought back and was able to pass button at the end of the main straight. Fernando Alonso spent most of the race behind Vitaly Petrov and could not pass him until 55 but then Petrov had puncture and was forced to pit for tyres and lost the chance to finish in the points. Kamui Kobayashi finished 10th to score sauber's first points of the season. Mark Webber took pole for the fourth time this season and for the third race in a row but the gap is smaller in this race than before ,as we saw Mclaren and Mercedes made a good step forward and Ferrari are struggling. With the track changing all the time it will be very hard not to make a mistake as we saw from all the drivers all weekend. Red Bull drivers were very close all weekend and in Qualifying it seemed like Sebastian Vettel had the upper hand but he could not deliver a great lap when it matters and Webber did but it . Mclaren seemed quick all weekend and they were very close to the Red Bull and to take pole for the first time this season with Lewis Hamilton driving a great qualifying today Button made a good jop too but the gap to Lewis was big this weekend. Mercedes made a great work today putting both their drivers in the third row but ths time Micheal Shumcher beat teammate Rosberg and will start from fifth place in the clean side of the track which might give him a good chance to make places at the start. As Always Robert Kubica made to Q3 but this time Petrov was also able to make it too ,Renault are making small steps forward with every race. Felipe Massa Said he made the most out of the F10 and even thought he love the track he said 8th place was he best he can and that they need to analyze the data to see where they are lacking. Alonso made a mistake on his last lap in Q2 and couldn't make it to Q3 and said that the most he could do. Kobayashi was very pleased to get through to Q3 for the first time, and that it was a significant boost for the team after Monaco. De la Rosa said the balance of his C29 was generally good, but that his had been at its best on the prime tyre. After missing all of FP3 with a hydraulic problem Sutil was unlucky to get squeezed out of Q3 by Schumacher, having done a great job for Force India. Liuzzi was again completely mystified by his car's lack of traction and snap oversteer, and reported that while he lost four-tenths to Sutil in the first few corners, he was quicker through Turn Eight. Only Liuzzi used the SRW today. Buemi said that Q3 was beyond the team's reach here, but that he'd expected better than 14th as he'd been ahead of the BMW Saubers in FP3. Alguersuari also felt there had been potential to do better, especially as he'd been blocked by De la Rosa in Turn Seven and had to change his line in a hurry. After playing second fiddle to Hulkenberg through practice, Barrichello jumped ahead when it mattered but said that the FW32 seriously lacked straightline speed here and that the car was less suited to Istanbul Park than it had been Monaco. Hulkenberg reported a tough day, with oversteer on the exit to Turn 7 his second Q2 run. Yet again, Lotus were top of the new teams, and they keep moving closer to the established midfield runners. Trulli had a few minor problems on Saturday morning, but was happy with the way he used his two sets of prime Bridgestone's. Kovalainen found the track too slippery for his first run on the option tyre, but was happy with his second go on the prime and especially praised the balance and stability in the high-speed corners. After their difficult day yesterday, a lot of overnight data analysis put Virgin right back on track and Glock was very close to the Lotuses and described the difference in his car as 'night and day'. But for a mistake in the second sector, he felt he should have split the green and yellow cars. Di Grassi, however, had a tough day, a power loss in Q1 frustrating his efforts to do better than 23rd. Senna was fairly happy with his performance as he was able to split the Virgins. Chandhok said that his car was slower than his team mate's on the straight, and that using the prime tyre instead of the option that Senna went for cost him another chunk of time. Red Bull's Mark Webber beats Lewis Hamilton to take pole position in Istanbul Park circuit. As in Q1 Sebastian Vettel kept leading in Q2 with the biggest loser in the Qualifying Fernando Alonso made a mistake at the end of the back straight that worn his tyres and couldn't made a good lap to put in Q3 as fell in 12th. In Q3 all the top 10 were hiding their true pace as Lewis Hamilton made a great lap that put him on pole but Sebastain Vettel was fast also but couldn't make a perfect lap and made another mistake at turn one to leave Mark Webber and Hamilton to fight for pole as webber got the upper hand at last and take his fourth pole of the season. 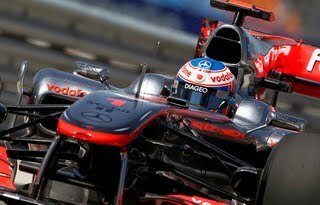 Mclaren Fastest again in friday second practice. Jenson Button edged Red Bull's Mark Webber in Turkey's Friday second Practice,Webber who stoped on the track with three minutes before the end of the practice. Sebastian vettel was third ahead of Mclaren's Lewis Hamilton with Ferrari's Fernando Alonso in fifth place,the times improved with track getting more grip as the cars lapping on the track. Mclaren set early pace in Istanbul with Lewis Hamilton leading home teammate Jenson Button Followed by Mercedes's Micheal Shumacher And Nico Rosberg ,The session went smooth with little mistakes from the drivers mostly at turn eight. Formula1 World Chamionship to Turkey for round seven ,The Istanbul Track 5.338 km and has a lot of high speed corners which require high Downforce level ,and the back straight that also need a car with high top speed.which will make the F-DUCT work good in this circut. Ferrari will bring back thier own version but with small difference the new system will be more user friendly ,in Barcelona we saw Fernando Alonso take his hand of the steering wheel in the straight to activate the system . Red Bull will test the system for the first time this season if they find it useful they will use it Qualifying and the race . The question is will Red Bull get that big margin we saw back in Barcelona as in Monaco we could not see the real strengthen of the RB6 ? Sebastian Vettel will try to repeat last years Pole and Mark Webber will hope to keep his momentum as he and teammate Vettel have 78 points each . Generally, the characteristics of the track, which runs anti-clockwise, should suit the car well. Bridgestone is bringing its Soft and Hard compounds, which theoretically have not been best suited to the F10, but much work has been done in this area to improve the situation and make the car competitive whatever tyre choice is available. Mercedes will bring the longer wheelbase car they used in Barcelona , the car that suited Micheal Shumacher and let finish infront of his teammate ,Shumacher is eager for a good result after his 20 second panelty in Monaco.